I always have roasted red peppers in a jar in my pantry because I use them in everything from chili to hummus. And I always have a vegetable of some kind lingering in the crisper drawer that I’m challenged to find something to do with before it reaches the end of its usable life. Often, the guilty vegetable is an eggplant. Someone buys it, but no one actually cooks it. So I’m come up with this roasted eggplant dip recipe to solve that problem. It’s a great dip for pizza night, because you can dip your crust in it. 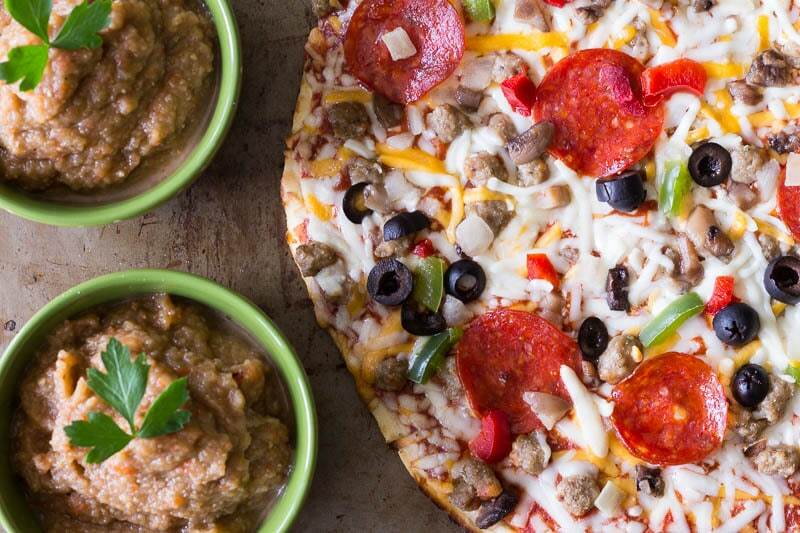 Pizza crusts are just more fun with a dip. Plus, it’s made with vegetables, and who can’t get behind that? And you can serve this dip warm or cold, depending on your mood or on the season. 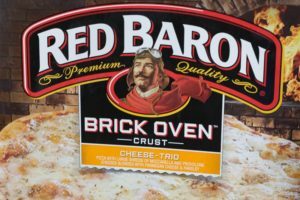 For our pizza night, I picked up some Red Baron Pizza: one Red Baron Brick Oven Cheese, and one Red Baron Classic Special Deluxe. Your family can come together over the timeless pizza that’s been around for 40 years. One bite, and everyone will want more. I know I did, especially with that crispy, crunchy Classic crust. 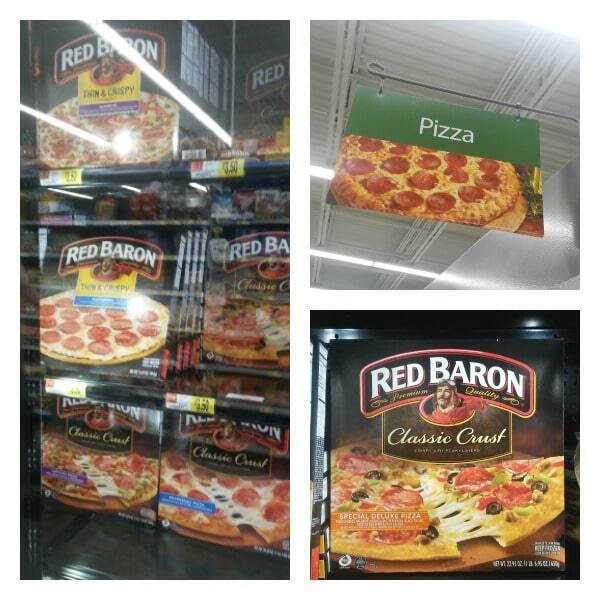 You can pick up Red Baron pizza at Walmart in the pizza section of the frozen food aisle. If you don’t have roasted red peppers in a jar, but you do have a red pepper, you can roast it at the same time. Cut open the top and remove the stem and seeds, then rub with olive oil and put in the oven with the eggplant. It will cook faster because it’s smaller, so remove the pepper when it’s easily pierced with a fork and let it cool. You can add roasted or fresh garlic to this dip if you’re a garlic lover. Simply blend in a clove with the rest of the ingredients. You can serve while warm, or chill in the refrigerator if you prefer. Store airtight and use within a day. 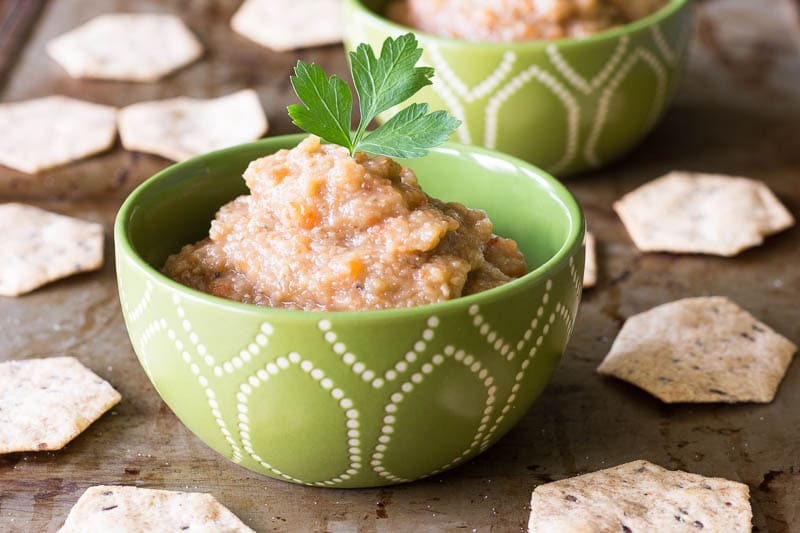 Make this simple roasted eggplant dip for dipping your favorite crackers, pizza crusts, chips, and more. It's very easy to do, and it's delicious! Preheat the oven to 425 F. Line a baking sheet with foil or parchment. Pierce the eggplant a couple of times with a fork. Place it on the baking sheet and then into the oven. Bake for 45 minutes, then let the eggplant cool until it is cool enough to handle. Cut the top (stem) off the eggplant, then remove the peel by pulling down strips from the top to the bottom. Place the eggplant plus all the other ingredients in a food processor. Pulse a few times, scrape down the sides with a spatula, then pulse again until it reaches the desired consistency. As pictured, it will be slightly chunky and it will hold its shape when scooped. Serve warm or cold. Store airtight in the refrigerator and use within a day. 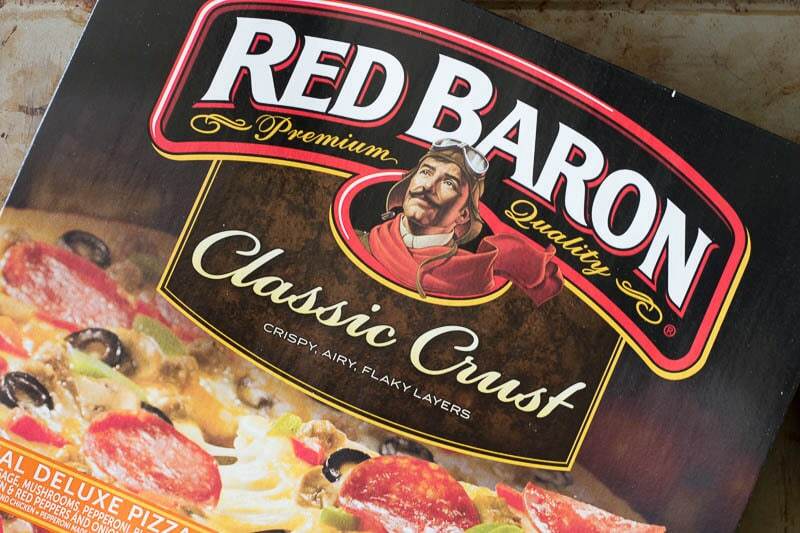 Check out Red Baron Pizza! Previous Post: « Win prAna Organic Clothing from prAna and Stonyfield Yogurt! So I’ve only dabbled in eggplant a tiny bit, like barely dipped my toes in the water, but I am getting a taste for it. I really never thought of using it for a dip, but it’s really different and I think it would be a great addition to any spread this summer! It’s good stuff. And eggplant is so good for you, too! YUM! I love any dip that uses roasted red pepper. And balsamic vinegar, the smell and taste just remind me of summer and lounging by the pool with crackers and dip. This would be lovely with an ice cold beverage. Thanks for sharing! What a great side dish for any kind of meal but added to pizza night is even better. We have a few of these pizzas in our freezer for impromptu pizza nights! Yummy!! perfect to have on hand. I always like to have a frozen pizza on hand. Beats going out! There are just so many possibilities with it. I love the fact that I can serve it hot or cold. Since it’s made with vegetable, I have a good excuse to use it more often for snacks and even meals. That’s why I like this recipe- it’s made with vegetables that are really tasty, so that satisfies my tastebuds and the need to eat more veggies. I don’t cook with Eggplant near enough as I should. We love the flavor, I just don’t think to use it. 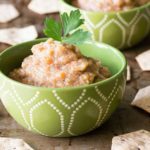 This dip sounds wonderful and will be a perfect addition to our pizza nights or cookouts. I look for every chance I can get to sneak in vegetables. 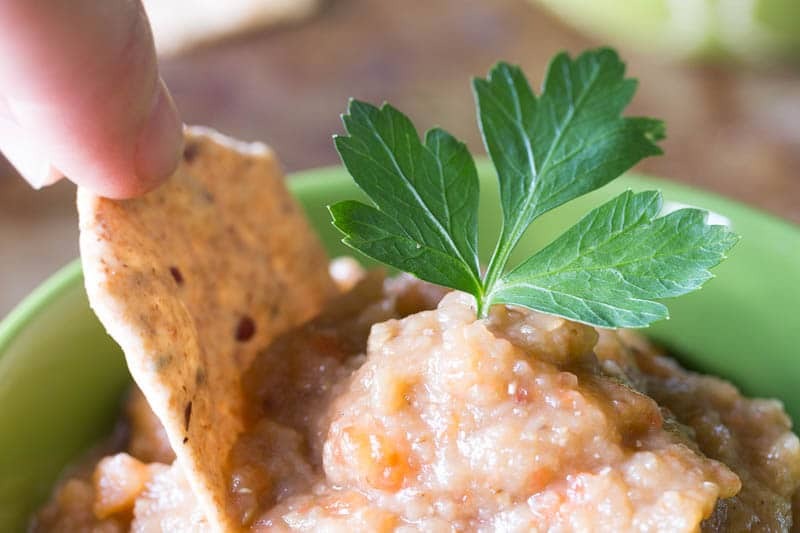 Sneaking in vegetables is a great strategy, and veggie-based dips are a good way to accomplish that! This sounds like a really interesting dip. My kids probably would not know that it was packed with yummy veggies! Probably not! If they can handle a mild salsa, they can handle this just fine. We love Red Baron! I have always been a fan of their pizzas. 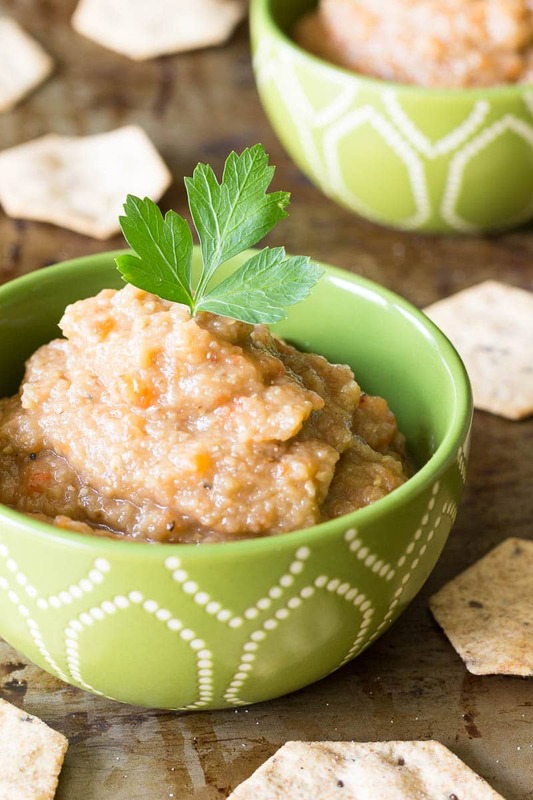 That eggplant dip is such a good idea! To be honest, eggplant scares me, so I never buy it, but I think I may have to try this! Don’t let it scare you! There’s nothing easier than throwing it in the oven whole and letting it roast. I love eggplant, though I prefer to eat it during the fall. My husband loves to grill it for me, so I can only imagine how this would taste if he grilled it and then made it into a dip. I’d probably go insane. Oh, wow, grilled would be fabulous! You’re so right!